THE STORY - Billy Batson is a streetwise 14-year-old who can magically transform into the adult superhero Shazam simply by shouting out one word. His newfound powers soon get put to the test when he squares off against the evil Dr. Thaddeus Sivana. THE GOOD - "Shazam!" takes the DCEU out of the darkness and into the family friendly world of bright colors, light hearted adventures and good ol' fashioned fun. The child actors are charming and make you want to root for them. THE BAD - It can be quite silly at times and runs the risk of losing its audience on more than a few occasions. I expected more from Zachary Levi and Mark Strong. ​​The DCEU has had a rocky road this past couple of years. However, lately it feels like DC Comics has finally decided to stop trying to copy Marvel Studios and has instead set their own course in movie history with a group of loveable characters that we all want to see do well at the multiplex. While "Wonder Woman" still remains their best effort to date, "Shazam!" takes the "meta" approach to the superhero genre, making this just as fun as "Aquaman" but not as dark as "Suicide Squad." The result is a kid-friendly superhero film that the 13-year-old inner child in me loved and the adult me can at least appreciate why others will love it more. Billy Batson (Asher Angel) is a 14-year-old orphan who can't stay within the confines of the law or in a single foster home. One day, he is magically transported to an ancient realm where a wizard (Djimon Hounsou, in a small and thankless role) grants him superhero powers believing that Billy is "pure of heart." 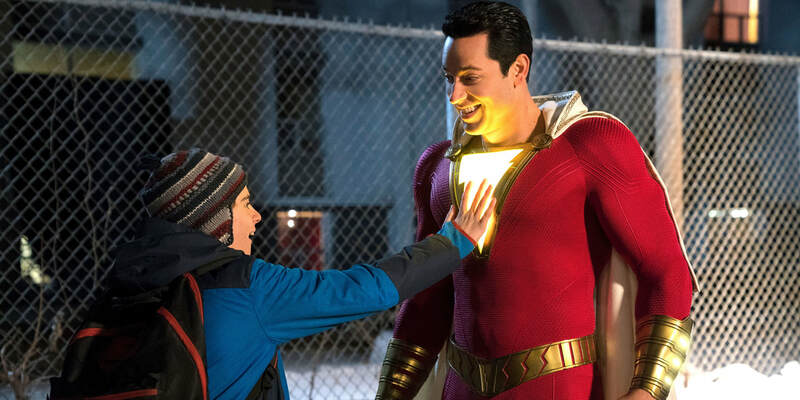 Billy is now an adult sized man (Zachary Levi) with superhuman strength, speed, flight, and other powers, who can alternate back and forth between his adult-sized self and child self simply by saying the word "Shazam." While the powers might be cool to him and his new foster brother Freddy Freeman at first, they soon bring unwanted danger when the evil Dr. Thaddeus Sivana (Mark Strong) comes to claim the wizard's power for himself. Honestly, on first glance, nothing about "Shazam!" appealed to me. Zachary Levi wasn't exactly the most exciting leading man choice. Mark Strong has done nothing but villain roles for 90% of his career. The costume that Shazam wears looked goofy and I noticed that the tone of the movie was going to be lighter than most superhero films nowadays. So, it was to my pleasant surprise that "Shazam!" somehow totally worked. It deals with magic, has kids at the center of its narrative and can be quite silly in terms of its comedy but there is an irresistible charm to it at is both endearing and entertaining enough to make this DC Comic adaptation for the big screen a winner! Zachary Levi and Mark Strong may get top billing. Asher Angel may play the lead. However, it's the supporting cast of child actors who occupy the same foster home as Billy Batson that steal the spotlight and run away with the laughs and our hearts. Jack Dylan Grazer already impressed a lot of us in "It" two years ago and here he gets to show more of his marvelous facial expressions, impressive comic timing, and indelible charm as Billy's best friend Freddy Freeman (Who, I've also been told, plays an even larger role in the comics down the line, which leads me to believe they really struck gold casting Grazer). Faithe Herman is so darn cute as the youngest of the kids, Billy's sister Darla. And the writers and Grace Fulton add enough to make Mary Bromfield, an actual character and not just a supportive potential love interest for the teenage hero. It's actors such as these and the level of balance director David F. Sandberg brings to their on-screen time plus the tone of their characters that helps to make "Shazam!" work. This is even more so evidenced by the level of investment we feel in these characters as a family unit by the time we get to the climactic final showdown involving all of the main characters. "Shazam!" is also quite funny at times and most of that is due to its "real world" superhero humor which not only helps to ground this film just when you think it might be veering too far into camp but it also allows us to kick back, relax and enjoy this special kind of superhero film for what it is. I guess you could harsh critical tendencies towards a film such as this were scaled back, once I realized what Sandberg and writer Henry Gayden were going for here, which ultimately allowed me to enjoy it more. Take for example, a mid-air confrontation between Shazam and Sivana. Mark Strong starts monologuing, which is something we've seen the villain do countless times within this genre and then, seemingly out of nowhere, the film will reveal just how self-aware and clever it is by calling attention to our own genre bias and expectations. This is just one example but there are countless others contained throughout "Shazam!" which I do not want to spoil here. While not perfect, "Shazam!" knows exactly which sub-genre of superhero storytelling it is operating within and as a result, there is a lot that can be forgiven and enjoyed for enjoyment's sake. Zachary Levi and Mark Strong are serviceable but its the child actors who really set this film apart, making "Shazam!" the perfect family-friendly superhero film that kids will enjoy and adults will enjoy enough. I still suspect many might roll their eyes at it and in some cases deservedly so, but after some of DC's more bleak and dour offerings, "Shazam!" feels more colorful, light and vibrant. A little variety never hurt anybody.